Nevertheless, we cannot simply characterize Kiesler’s attention to the context as a visionary precursor to postmodernism. Postmodern art practice is often traced back to minimalism, which shifted the viewer’s attention away from the artwork and towards the gallery, and showed that the meaning of an artwork is a function of spatial context. Postmodernism then evolved to practices like the institutional critique, which focused on not only the spatial but also the social context of the artwork. 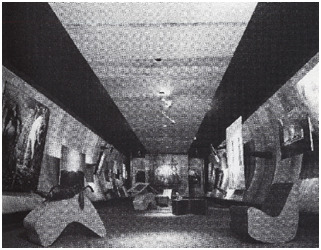 To situate Kiesler’s career in relation to such practices, we must evaluate the “Second Manifesto” with reference to “Correalism”—Kiesler’s theory on the correlation of artwork, people, and space—which he conceived in the 1930s and developed through a series of writings leading up to the manifesto. Analysis of Kiesler’s theory, as well as his architectural works, shows that Kiesler’s understanding of the context does not necessarily correspond to the postmodern attention to context. 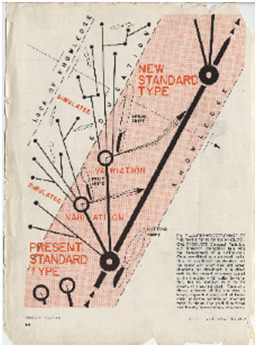 Frederick Kiesler, “Second Manifesto of Correalism,” Art International 9 (March 1965): 16. Brian O’Doherty, Inside the White Cube: The Ideology of the Gallery Space, expanded edition. (Berkeley and Los Angeles: University of California Press, 1999), 15. Can we ever see Modernism for ourselves? Or is our understanding of Modernism, and indeed our ability to truly see the buildings of its canon, forever mediated (manipulated?) by the antecedent gaze of the photographer? This paper critically investigates the photography of Julius Shulman and Ezra Stoller and its use in capturing, disseminating and defining the Modern architectural movement of the mid-twentieth century – architecture rendered principally in steel and glass. If Modernism wanted official PR men, it could do no better than Julius Shulman and Ezra Stoller. Both began their photographic careers in the mid-1930s as Modernism was crossing the Atlantic, Shulman on the west coast and Stoller in the east. Both may have been chronicling the building and buildings of the Modern movement, but they were photographing two very different sorts of modernism. For Shulman that meant houses, specifically in suburban Los Angeles, while Stoller photographed the glass skyscrapers rising in Manhattan. It wasn’t merely difference in subject types that set the pictures of Shulman apart from those of Stoller. What is of more interest, is the divergent interpretations of modernism – and the rich narrative each developed through his images. This paper investigates these narratives by closely examining a selection of the most representative and recognizable images by each photographer.